Just in time to beat the end of the calendar year, it’s time for my annual round-up of webcomics I’ve started reading in the past year. As usual, I cover both strips I liked and strips I that didn’t work for me, and quite a few in between. If you’re just interested in the good stuff, I’d most recommend Derelict, False Positive, Guilded Age, Widdershins, and Carpe Chaos. You can find my past entries here: 2009, 2010, 2011. The Adventures of the 19XX, by Paul Roman Martinez: I discovered this strip through its Kickstarter, and backed it because I find buying the physical collections is a great way to catch up on a long-running Webcomic (more convenient than clicking through a couple hundred web pages). The second volume is wrapping up on the web now. The premise is that of a group of adventurers in the early 1930s who are crossing the world looking for mystical artifacts which could change the future, perhaps by preventing the second World War that’s coming. They’re opposed in this by a secret cabal who want these artifacts for their own purposes (usually to rule the world). The story features a lot of period settings and technology, so it has an Indiana Jones feel to it. That said, I’m lukewarm towards the strip. The storytelling is pretty flat, and the dialog often feels stiff. The characters – and there are a lot of them – are pretty simple and their motivations are not very strong. Since the strip has a strong pulp feel all of this is in keeping with that, but there are a lot of pulpy stories around today which have more modern sensibilities underlying that pulp feel, and this one doesn’t measure up. The art is pretty good, but again often feels stiff, carefully laid out but not very fluid. Overall if adventures in this time period are your thing, then you’ll probably enjoy this. But if not, then it probably won’t be. Balazo, by Bachan: Bachan is the artist for Power Nap, and he’s quite good. Balazo is the English-language site of this Mexican illustrator’s work, and I’d characterize it as “lightweight, but entertaining”. It involves anthropomorphic characters, and focuses on the adventures of an outside-the-boundaries cop. In that way it somewhat resembles the print comics Grandville or Blacksad, but it’s not as hard-hitting or meaningful as either. Boston Metaphysical Society, by Madeleine Holly-Rosing & Emily Hu: I came across this at APE and decided to check it out. It looks like it’s being published as a webcomic with the intent of ultimately publishing it as a comic book mini-series. It’s a steampunk adventure about a group working to contain psychic forces which have been unleashed on the world, in the structure of a young woman trying to persuade an experienced male agent to let her accompany him. Various historical figures show up, too. Carpe Chaos, by Eric Carter, Jason Bane, Anthony Cournoyer, Daniel Allen and others: I picked up a collection of this science fiction webcomic at APE last year, but it took me a while to catch up on the full site. 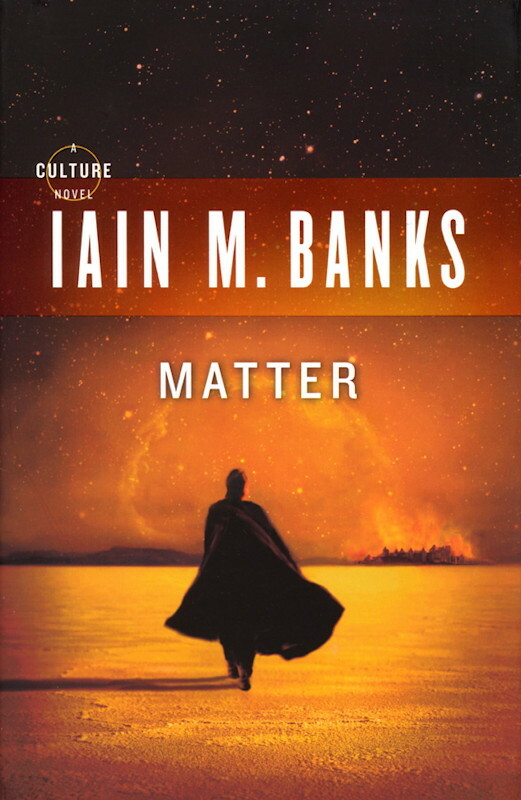 This is a “soft” SF story, in that it’s more space opera then crunchy science; it focuses on the interactions of several alien races (which all look extremely alien), exploring themes of tolerance, understanding, difference, prejudice, and the like, highlighted by the different outlooks of each of the species. It’s very well done, and the individual stories are generally excellent. The creators clearly have a large universe they’re working in, but it’s often not at all apparent to the reader at which point on the timeline a story occurs, which makes some of the stories a little confusing. Other than that my biggest complaint is that it updates infrequently, but it’s well worth reading. All-digital art by multiple artists is quite good, too. Cat vs. Human, by Yasmine Surovec: Gag-a-day comics about the author and her feline obsession. Funny if you love cats, probably not if you don’t. Cyanide and Happiness, by various: Another gag-a-day strip by multiple people, all working in a common almost-stick figure style. Highly cynical and irreverent, often being deliberate obscene, occasionally with punchlines that seem like non-sequiturs. I guess this is one of the more popular webcomics, but I think it’s merely okay. If you can’t tolerate gratuitous obscenity and nastiness in a strip, then avoid. Derelict, by Ben Fleuter: After going a while without finding a new webcomic I really adored, Derelict was a revelation: Fantastic artwork, fine world-building, and a gripping story. The heroine is a young woman in a future after the world has been flooded, operating her own salvage ship and trying to stay alive in a changed world where no one can be counted on to be friendly (and which is also populated with some strange things). The details in the art are stunning at times, and the atmosphere of loneliness punctuated by occasional hope is powerful. The biggest downsides are that the heroine’s face sometimes looks awkward (although she’s very expressive), and the erratic update schedule. Despite these, I still recommend it highly. False Positive, by Mike Walton: An anthology comic written and mostly drawn by Walton, each story lasts a few weeks and is frequently in the horror vein. If you enjoy The Twilight Zone then you’ll probably enjoy this, although the illustrations are sometimes quite graphic. Walton’s art is outstanding, and his coloring – which uses a distinct limited palette for each story – compliments the art very well. “Season two” just started, but read through season one – you won’t be disappointed. Guilded Age, by T. Campbell, Phil Kahn, Erica Henderson & John Waltrip: I had tried to read this once before and got bogged down, I don’t know why. When I tried again this year, I was hooked. From the start it’s an entertaining medieval fantasy strip (I guess it’s based around World of Warcraft), though it takes a few chapters to get going as initially it’s a series of vignettes mixing adventure and comedy, focusing on a band of five heroes. The strip features a number of anachronisms, especially in turns of phrase and the attitudes of the characters, which seem to be there to add some color and relatability for the reader. The strip really comes together in chapter 8, which reveals a number of previously-unrevealed things about the world, and providing a larger structure for the story which makes you really feel for our heroes. There are strong indications of what’s really going on, but it’s taking a while to get there (not that the journey isn’t enjoyable on its own). Read this one from the beginning; there are several hundred pages to catch up on, but it’s worth it. Just be a little forgiving of the first few chapters, until the story finds its feet. The Hero Business, by Bill Walko: A superhero strip in which the heroes have a publicity company, it’s been around for a while but I just started reading it recently. It’s written like a soap opera, drawing comparisons in my mind to Love and Capes. L&C is to my mind the better of the two, having a stronger character focus and, well, generally better gags. Walko’s art is quite stylized, with the characters all looking like teenagers to my eye. Overall it’s a cheerful strip – kind of an homage to 60s and 70s superhero comics – which hasn’t won me over yet. Incidental Comics, by Grant Snider: This came to my attention via his oft-reblogged comic “Pig Latin”, his site is a series of understated, philosophical jokes which should appeal to fans of xkcd or certain New Yorker cartoonists. A recent favorite of mine is “Story Structures”. His art is somewhat minimalist, but still eye-pleasing. Rich Morris: An artist who did an epic Doctor Who comic titled “The Ten Doctors”, and who does various other strips on this site. These are strips he does for fun in his spare time, so the art is often sketchy, but he’s obviously quite skilled (I think he’s a commercial artist by profession), and TTD is very good. He hasn’t updated much since I started following him, but check out his archives. Nerf Now! !, by Josué Pereira: I have to say this is one of those strips that I just don’t get, at all. I think it’s a somewhat meta strip based around video games? It seems to involve a curvaceous woman and her friend who is a tentacle (? ), in a series of gags without a running storyline. It’s drawn in a simple manga-esque style, but I just don’t get it. The Oatmeal, by Matthew Inman: Another irreverent gag strip, whose creator got a lot of attention recently for thumbing his nose at a lawyer who pressured him. That incident aside, the comic is generally funny, though probably not everyone’s cup of tea. Inman’s exuberance comes through in every panel, including in his ode to Nikola Tesla, giving it a rather different attitude than the usual wry humor of many gag-a-day strips, and one that feels more genuine than, say, Cyanide and Happiness, which often seems nasty just to be nasty. The Oatmeal is surely not for everyone, but I like it. The People That Melt in the Rain, by Carolyn Watson Dubisch and Mike Dubisch: A creepy comic about a mother and her daughter who move to a new town and promptly get rained on by frogs, and then learn that actual rain burns the people who live there. The comic follows the daughter, Laura, learning about the curse that hangs over the town, and the various effects it has on its inhabitants and visitors. The strip went on an extended hiatus, and when it came back the art seemed sketchier and murkier than before, and the story feels like it’s meandering around rather than making progress. It’s okay – you might find it easier to follow than I have. Saturday Morning Breakfast Cereal, by Zach Weiner: SMBC is a popular gag-a-day strip with no recurring characters and strips that run from a single panel to ten or twelve. Subject matter is typically irreverent and sometimes over-the-top, with a regular theme of taking ideas to their logical and ridiculous extreme. Despite this, the strip doesn’t really grab me: It’s not as clever as xkcd, not as profane as Cyanide and Happiness, and the art is simple bordering on sketchy. I know lots of people who are fans, but it doesn’t do a lot for me. Shortpacked!, by David Wallis: I’ve actually already stopped reading this one. It’s a slice-of-life strip centered around employees of a toy store, with hijinks that regularly ensue, but it just didn’t grab me: I found it hard to tell the characters apart and the gags didn’t really work for me. The art is okay, on the simple side. Overall I think Comic Critics covers similar territory more effectively (though to be fair I find a comic shop a lot more interesting than a toy store). On the flip side, All New Issues also takes place around a comic book store, and I like it only a little more than Shortpacked! Wesslingsaung, by Eric Cochrane: This has to be the most exotic comic I’ve found this year, as most of the characters are nothuman. The title character is, well, I think he’s an adventurer who travels his world – occasionally traveling through time – with a centipede-like partner named Gossip. Wesslingsaung is looking for humans, and eventually finds one, and then his adventures really begin. It’s a strangely compelling strip, although its dreamlike quality and loose plot has made it hard for me to follow, and the characters’ motivations are still murky to me. It feels like it could be a much better strip with some additional clarity. On the other hand, the inventiveness is appealing, and though Cochrane’s art is fairly simple, it’s equal to the story in inventiveness. So I’m sticking with it to see where it’s going. Widdershins, by Kate Ashwin: Taking place on the cusp of the Victorian age (the first story starts in 1833), Widdershins is a town in an England where magic is real. There have been two complete – but separate – stories so far. The first features artefact hunter Harry Barber and down-on-his-luck young wizard Sidney Malik forced to work together to recover a valuable treasure. The second involves a pair of wanderers who get caught up in an evil plot involving mystical spirits. The third story started recently and returns to Barber and Malik for their next adventure That’s putting it all very simply, but both adventures involve colorful characters and incredible plots, and it’s quite a fun ride. Ashwin’s art is on the cartoony side, but detailed enough, and it fits the fairly lighthearted tone of the strip. Refreshingly, it’s not really steampunk because all the fantastic elements are magic, not science. It also had a Kickstarter recently. The Wormworld Saga, by Daniel Lieske: This is not your typical webcomic. For one thing, each chapter is published in its entirety when Lieske finishes it, with several months between each (there are four chapters currently up, the last having been published in August). For another, each chapter is a single vertical “page” with panels arranged within it, and you scroll down continuously to read it. This gives it a look like no other webcomic I’ve seen, and the fact that Lieske’s full-color art is gorgeous helps too. As for the story, it’s about a boy in our world in 1977 who discovers a portal in his grandparents’ house to another world, a fantasy world in which he is apparently destined to be a major participant. It has themes of childhood imagination and wonder, but also alienation and being thrown into adult concerns while still a child. But while lavishly envisioned and illustrated, the story is (so far) not much more than that; I enjoyed reading it more for the art than because I really wanted to know what happens next. I’m also somewhat suspicious of any story with the world “saga” in the title, as it always strikes me as being a little pretentious (or at least non-descriptive). But if youthful fantasy if what you like, then you’ll probably love this. Blue Remembered Earth is near-future SF, taking place in the 2160s. Following two centuries of climate change (global temperature shifts, depletion of traditional energy supplies, rising sea levels), Africa is on the cusp of displacing China as the dominant world power. The powerful Akinya family dominates Africa and has interests throughout the solar system, to which humanity is still confined. Geoffrey Akinya and his sister Sunday are inheritors of the Akinya legacy, but both are marginalized by their family due to a shared lack of interest in its business affairs: Geoffrey researches elephants, while Sunday is an artist on the moon. But when their grandmother Eunice dies, their business-oriented cousins enlist Geoffrey to go to the moon to check out a safety deposit box she left behind. What he finds sends him and his sister on a treasure hunt throughout the solar system, following her path as an early explorer of Mars and beyond, despite great resistance from their cousins. The novel has two major characteristics: It’s a world-building endeavor, and it’s a science fictional mystery involving a trail that Eunice left for her family to follow. In general, I’m not a big fan of near-future SF, because the ideas are not big enough to satisfy me, and I’m just not terribly interested in extrapolating our current situation out only a century or two (i.e., a period where things are largely similar to our world today with some fairly straightforward changes). I appreciate what, for example, Charles Stross is doing in Halting State and Rule 34, but it’s more the story than the setting which pulls me along. I particularly dislike settings like that of Paolo Bacigalupi’s The Windup Girl, with dreary settings, little hope, and unlikeable characters. Geoffrey and Sunday’s quest operates as a travelogue of the solar system, as Geoffrey goes to the moon where he visited Sunday in the “Descrutinized Zone”, which is free of the Mechanism. There’s also a trip to Mars, which is just barely on the civilized side of being a frontier and has a few amazing wonders of its own. They’re accompanied in this by a telepresence simulation of Eunice herself, who embodies the character of the woman but naturally lacks many of her memories. But as Eunice was both family to the pair, and a significant figure in the exploration of the solar system, she plays a significant role. Reynolds’ characterizations are not his strong suit, and BRE is not out of step with the rest of his work in this regard: Geoffrey, Sunday and Eunice are reasonably drawn, the other characters are largely two-dimensional. And there’s not a lot of character development – Geoffrey struggles a bit with not wanting to make waves with his family beyond what’s necessary for his research, but doesn’t want to just roll over and do whatever the cousins want, either. This tension does come to a head, but the resolution is somewhat dictated by outside forces, so there’s not a moment of epiphany or a significant character shift for him. 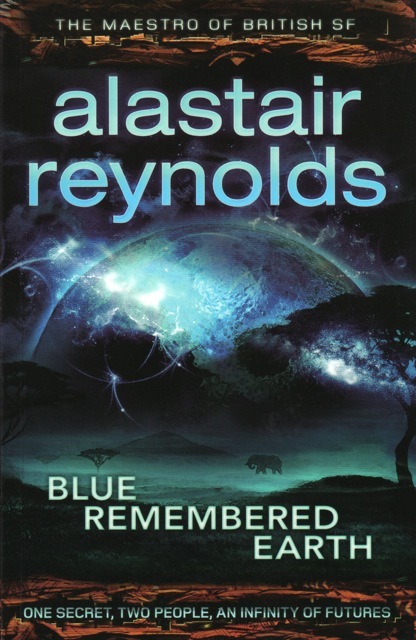 Blue Remembered Earth is sometimes noted as the first volume of a series titled “Poseideon’s Children”, but there’s almost no indication of that in the edition I have (save an offhanded comment in the author’s afterward), and the book in fact stands on its own perfectly well, not so much the first of a series as a novel which could have sequels. Overall it’s a pretty good book, an enjoyable ride, probably sitting somewhere in the middle of Reynolds’ oeuvre in my opinion. 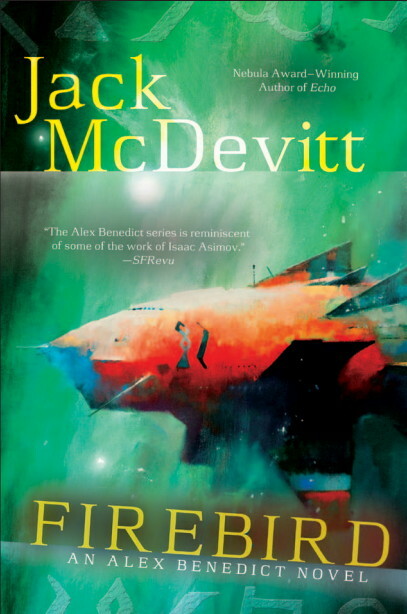 I’ve given McDevitt a hard time over his Alex Benedict novels since the terrific A Talent For War, but I’m happy to report that the latest in the series, Firebird, is the best since that inaugural effort, with a genuine sense of wonder, a nifty plot twist and a satisfying conclusion. The story opens with antiquities dealer Benedict’s aide, Chase Kolpath, being approached to sell some items from the estate of Christopher Robin, a physicist of some note who disappeared several decades earlier. (Yes, unfortunately the disappeared man has the same name as the boy in Winnie-the-Pooh, but oh well.) Chase doesn’t know who he is, but Alex fills her in: Robin was notes as being a proponent of there being alternate realities, and supposedly having been trying to find a way to them. One evening he returned from a trip with his pilot, who dropped him off in front of his house, and he disappeared. The pilot then volunteered to help with rescue efforts in a major earthquake and was killed in the process. While Robin is assumed to have died, no one knows for sure. Maybe he found a a way to other realities and simply stepped into one. Alex doesn’t really believe this, but hits the talk show circuit to build up Robin’s mystique to make the most money for his client. But then, as always happens, he gets bitten by the bug to find out what really happened to Robin. THe investigation turns up a few facts: That Robin had become interested in reports of mysterious ships that occasionally appear near worlds, stations or other ships and then disappear without ever being identified. That he had a friend he went on missions with who was killed on one of them. That he was interested in a world named Villanueva, where human life had died out centuries ago but the trappings of it had been left intact. And that he had bought several old spaceships and taken them out in the 15 years or so before his death, returning without any of them. It all adds up to something that doesn’t equal parallel realities, but does equal something just about as cool, which even raises the specter of one of the earliest background elements of the series. McDevitt often stretches to put Alex and Chase in danger, sometimes a little too far as neither of them is a fighter, and the risks they take sometimes seem ridiculous. But he does a better job of balancing this than in recent novels. He also does a good job of taking one of the side plots and turning it into a serious moral dilemma and distraction from the main plot. Best of all, once we learn what’s really going on, he lets Alex and Chase get to the meat of the problem, and there are several wrenching scenes where we learn what happens to several characters. Fortunately there’s also a satisfying afterward which ties up one of the loose ends. So McDevitt really gets just about everything right in the novel. Overall the story doesn’t have quite the impact of Talent, and the nature of the series takes just a little wind out of the sails of the potential of the story (in a true standalone novel, there’s the potential for a lot more exploration of the plot twist which can’t really happen here without revealing more about Alex and Chase than can really happen here). But it’s still a really fun novel, and quite a page-turner too. If you’ve bailed on the series prior to this, I suggest getting back on board at least for this installment. 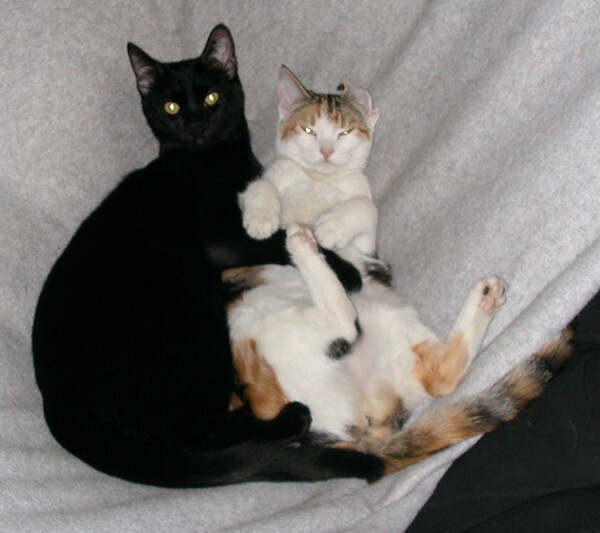 Debbi says that when she went to get Blackjack and Roulette she knew Blackjack was the cat for her. 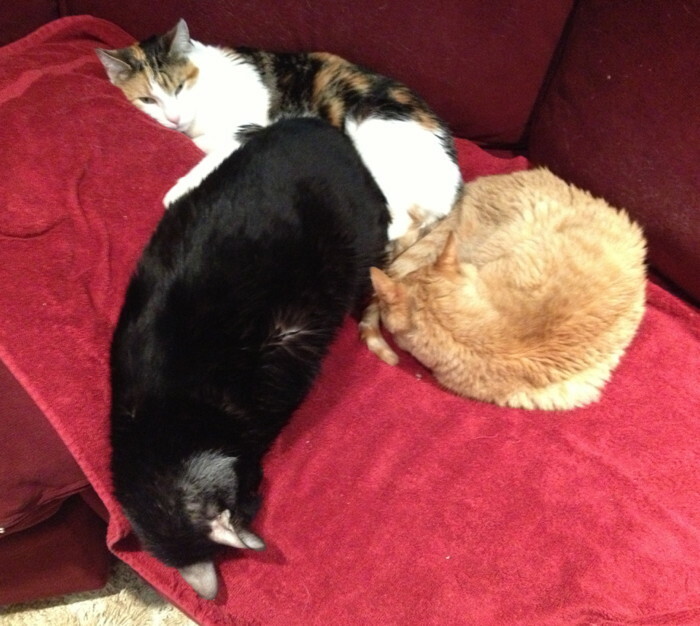 I think she got Roulette partly because Roulette seemed to like me, but Blackjack was the cat for her. 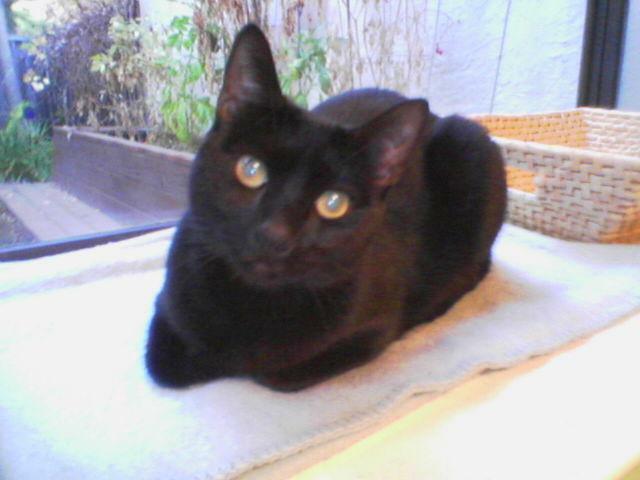 She wanted a black cat, and he played hard and seemed to like people. He came with his name, while Debbi came up with “Roulette” to match him. 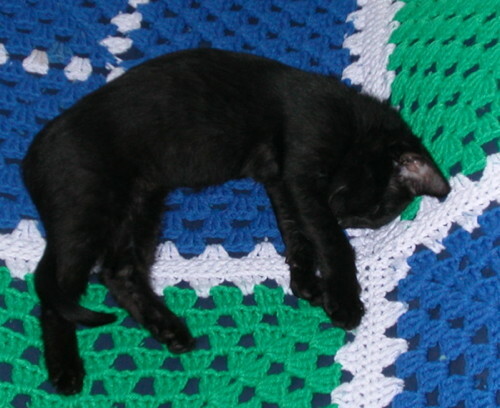 Blackjack was a little sick as a kitten, but got over it. Then he became all kinds of trouble! He was bold and liked to check everything out. And after he played hard, he crashed hard and slept hard. He just kept going until he was done, and then he climbed somewhere he felt safe and zonked out. 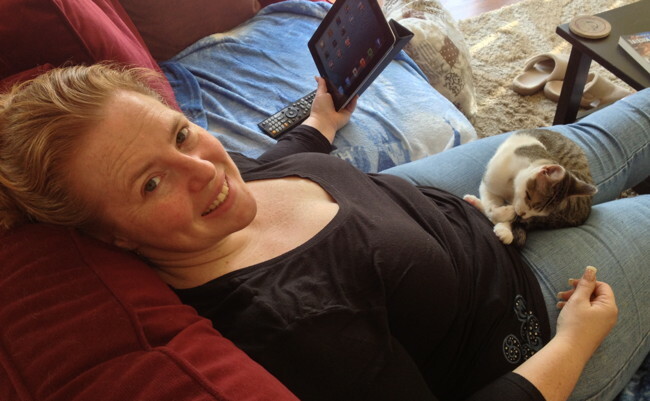 Blackjack also chose Debbi as his human. 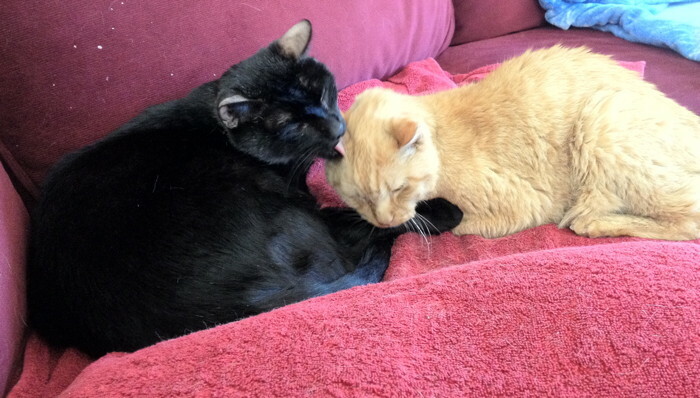 He would often nuzzle at her neck while kneading her and purring, something we called “giving her wuv”. 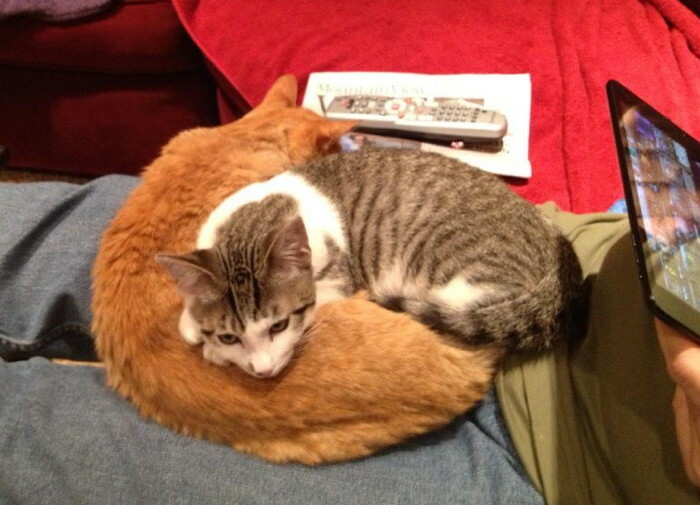 He only did this for me once, when he was a kitten and she was visiting her family back east and had left them with me. But otherwise this was something he saved for her. I think he had designs on becoming top cat when he came to my place, but Jefferson knocked him off of that idea promptly. 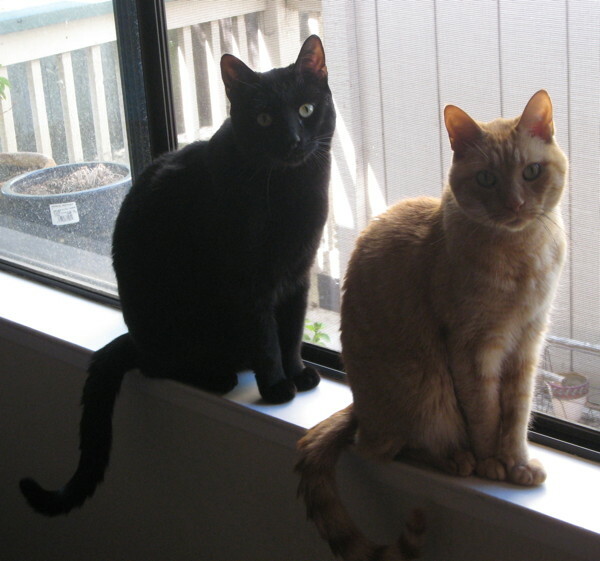 Then he and Newton started fighting to see who would be second cat. 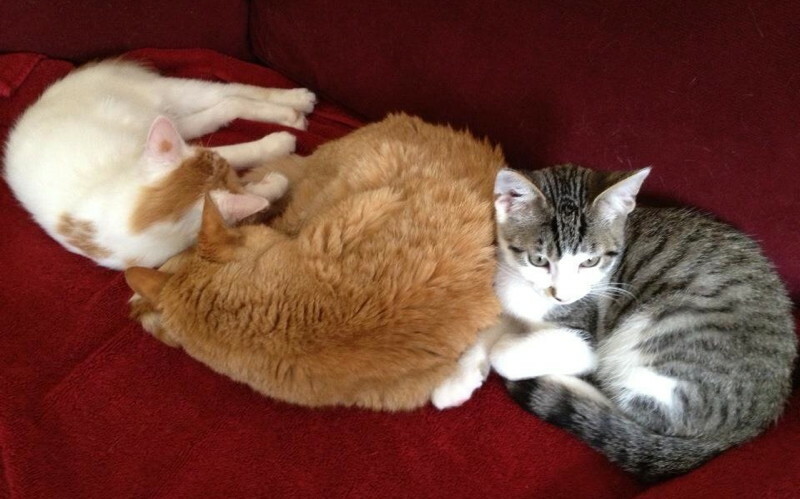 We called them the “silent wrestlers”, as they would struggle on the floor without meowing or yelping. I’m not sure who won that struggle, since when Jefferson passed away we think Roulette moved from being bottom cat to being top cat, without anyone putting up a fight. 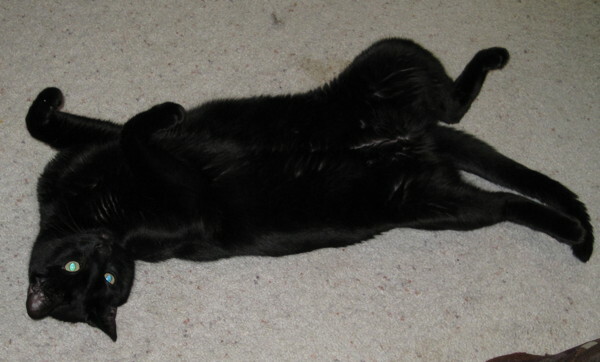 Blackjack was a very demonstrative kitty: He would often fall asleep on the floor, and then eventually end up lying on his back, exposing his tummy for everyone to see. We think he meant he was happy and comfortable with us. He was also very strong, being 14 pounds of pretty solid muscle, with powerful hind legs that could let him leap sideways quite some distance from a starting position. He had the most pathetic meow, sounding like someone was torturing him, when he was perfectly fine. 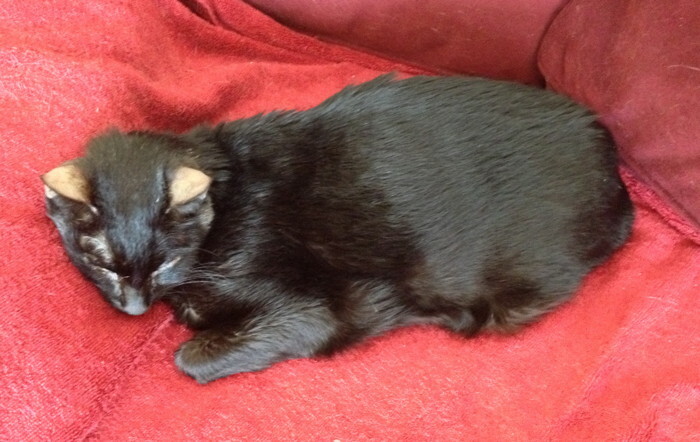 Since he was all black, he could meow without us seeing his mouth open, which was pretty weird at times. 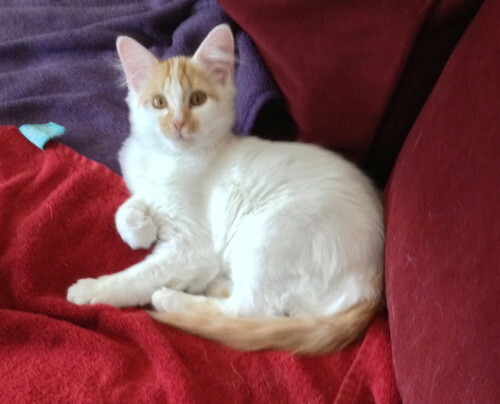 Like I said, he was a trouble-maker: He was a shoelace chewer. He liked to eat vegetables: Corn, frozen peas, and he’s gnaw on banana peels. Once he went deaf he got even pushier at the dinner table, trying to grab our food, and of course saying “no!” to him would have no effect! He would sometimes pull out one of his nails grooming himself, with just the quick sticking out from his paw. The nail always grew back, but that was kind of strange. 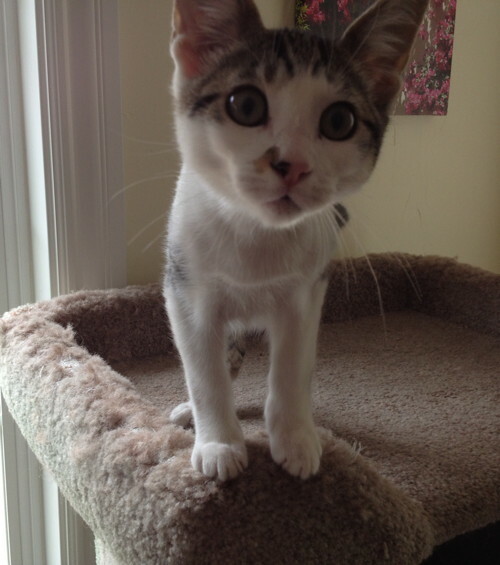 He and his sister wrestled and chased each other a lot. 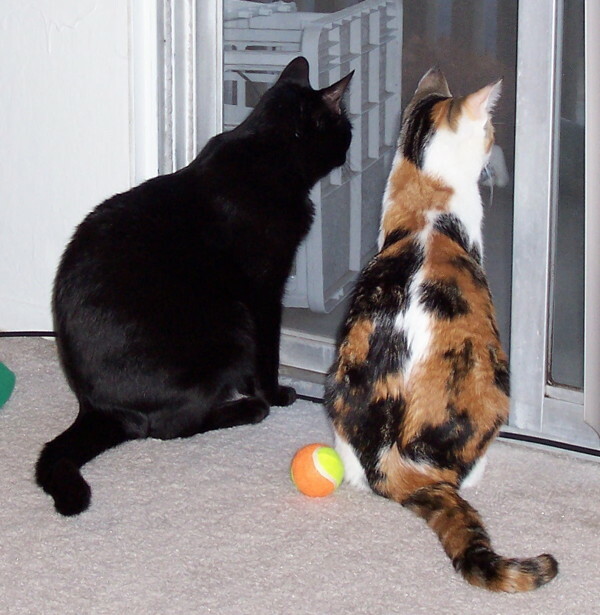 When they started chasing each other upstairs at the townhouse Debbi would say, “The elephants have been released!” Blackjack would often play harder than Roulette really wanted, and she’d meow in protest until we separated them. But he didn’t bite or otherwise cross the line. 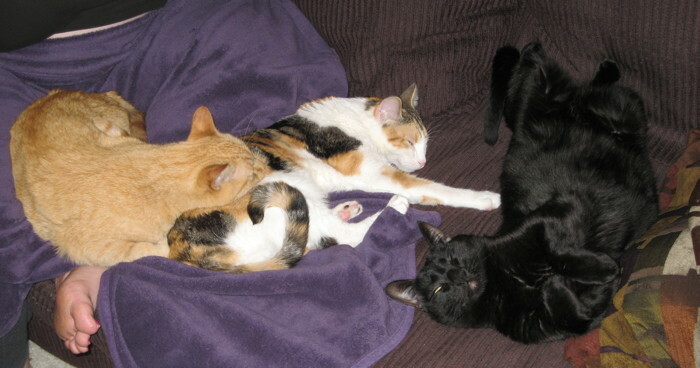 Blackjack was – along with Newton – our social cat. He’d hang out when we had visitors, and as recently as last month he was up on the dining room table checking out what we were up to when I had friends over to play Magic. When our friends Lisa and Michel brought their daughter Isabella over, he was the one who eventually went over to check her out. 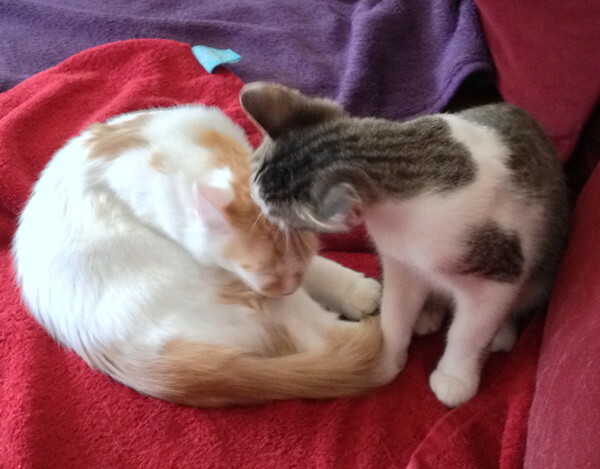 She sat down and he sniffed her from toe to head, with her looking a bit startled by it all. Then he decided that was good enough for him and he left. He would find strange places to sleep: Under the shelves in the closet at the townhouse. Under the desk. In the laundry basket. Places where it was hard to spot him because he was all black! He liked sleeping under the Christmas tree, too. 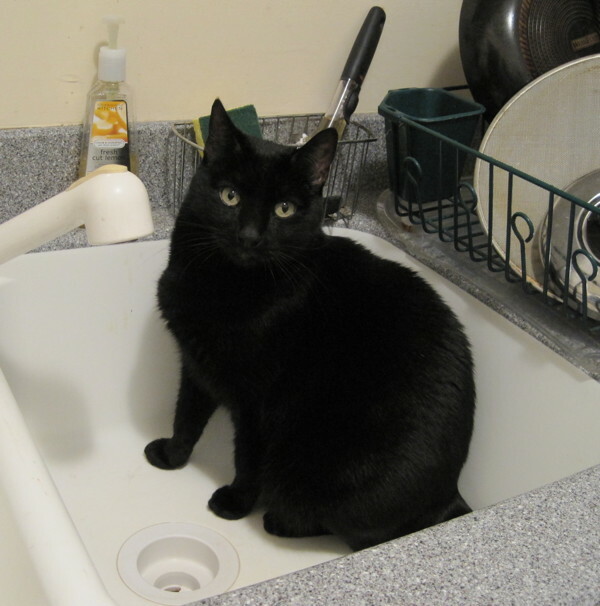 He also discovered the heating vents under the cabinets in the new house, and enjoyed sitting in front of them last winter; he’d usually be in front of one every morning when I came down. He liked looking out the window, and was more curious than agitated when we got outdoor feline visitors (whereas Roulette would go nuts over the intruder). And of course he would play: Jump after toys, run up and down the stairs. My Mom gave us a two-foot-long tube with fleece on the inside, and I could get him to run back and forth through it for quite a while. And then he’d get tired and he’d sack out inside it. Like the other cats, he enjoyed being carried outside, but he was especially aggressive about trying to eat grass if we put him down, so we usually didn’t.